So I know I have mentioned this before but let me just tell you again.. I love Thai food.. I do.. I really do.. I love the spices, I love the flavors.. the aromas.. the the the.. you get it.. It’s sweet, it’s spicy, it’s tangy.. It’s just ummm perfect.. I think in a way it’s just exotic.. 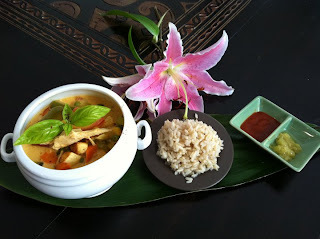 I think Thai food, I think the images on TV and in magazines.. I am suddenly transported to a serene country side with lush green forests, orchids blooming everywhere, and gentle music in the background.. wait, that reminds me of our local Thai restaurant.. anyway, bottom line is people, I love Thai food and this below is my version of Thai curry. In some OO, sautee some onions, ginger and the curry paste and cook for about 5-6 minutes till brown (NOT BURNED). Add the chicken and brown the chicken on medium heat. (about 6-8 minutes). Add the coconut milk and all the veggies. Add the spices and the herbs. Add about a cup of water. Simmer on medium heat (covered) till the chicken and the veggies seem tender. (about 10 minutes).